In Phase III of our Group Parayan, we had included Jahnvi in our prayer list. we have removed her name in the recent Group Parayn Prayer list. "due to financial problem, the treatment and operation is still pending". surgery she is now in ICU and under observation. My kind request to you all please pray for Jahnvi's speedy recovery and healthy long life. 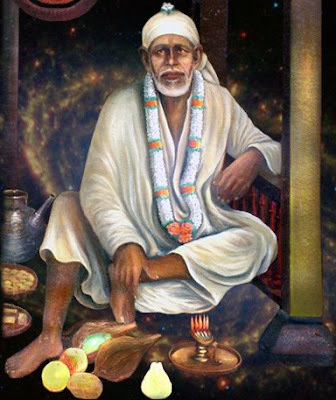 MAY SAI BE WITH US AND WITH OUR FAMILY ALWAYS& BLESS LOVE, LUCK AND HAPPINESS ABUNDANTLY! from Thursday, 1st August 2013. Group parayan from this week. Jahnvee, who is in ICU after her heart surgery and who is under observation. DwarkaMai's heartfelt "THANKS" to you all for your sincere prayers. and here's her pic sent by her father. Please add my prayer in your prayer list. Please sai ram help my brother Nikhil and cousin brother sanjiv. please help to admit their cases in supreme court. please help them to come back home and allow them to live with their families. please sai ram help us. you know what is the reality and you always helped us. please help us again. and to get peace & solace in their life. Thanks for considering my prayer and giving me chance to be a part of group parayana. office again from today . I heartly thanks to the entire devotees who pray and perform Group Parayan for this noble cause. Please do continue praying so that he can live a healthy life ahead. May Baba Sai always bestows his blessing on all. going through various health issues from past 5months. I am requesting prayers for my mother who is afflicted with breast cancer. as his eyes and touch is more powerful than any medicine and treatment. Few doctors said it is treatable but with chemotherapy. My mother can't withstand that treatment. and have surrendered unto him. Baba can do wonders for all. Kindly add a Prayer Request for 2 years old kid - Tejas Prasad to heal him from frequent illness ... to have good health and bright future. Page created in 0.324 seconds with 71 queries.